The real heroes in any disaster are the first responders, public servants, and neighbors who rush in to serve, saving lives. 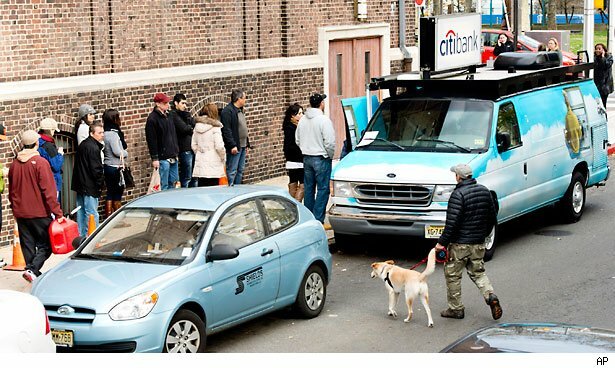 In the past few days, as New York and New Jersey have faced an unprecedented storm, private sector corporations have also stepped in, lending support and services to the victims of Hurricane Sandy. Although their motivations might not always be pure, their actions deserve recognition. As can be expected, however, the storm has also unveiled a few unsavory characters, merchants ready to profit from the storm or those looking for a way to promote a private agenda. As the Hurricane Sandy recovery and rescue efforts continue, here's a look at some of the emerging corporate heroes, antiheroes, and villains of the ongoing story. Over the past few days, one of the most valuable tools anyone could have in storm-hit areas was a cell phone. Of course, if a network is experiencing coverage issues, even the fanciest hardware is rendered useless. Rival companies Verizon (VZ) and T-Mobile, therefore, signed an agreement allowing customers to roam across both networks in areas where service was limited. Their contract may have saved lives. We know banks give heavily to charities, and Wall Street donations to Sandy-related causes have already been forthcoming. Better still, some banks are giving the average customer a break. As Sterling Wong reported, Citigroup (C) and TD Bank (TD) both made immediate announcements saying that overdraft fees, late fees, and fees incurred for using out-of-network ATM fees would be waived throughout storm-hit areas. American Express (AXP) said it would work out flexible payment schedules for storm victims. The store nicknamed "Whole Paycheck" for its high prices surprised some Manhattan residents with a generous offer. On October 31, Whole Foods (WFM) in New York's Tribeca district -- one of the neighborhoods that lost power Monday night -- had food on shelves and in storage that was about to go bad. Management could have held a fire sale but instead decided to hand out all perishables for free. Twitter alerts brought instant crowds and news crews. Any retailer that allowed residents without power to charge their cell phones and computers became a hero this week and remains such. Meanwhile Adorama, a camera store on West 18th Street, went one further, setting up a charging station in front of its storefront. Uber is a San Francisco start-up that allows customers to order a town car using a smartphone app. It follows a dynamic pricing model, meaning fares are higher when rides are in higher demand. Instead of making a killing during the storm, Uber decided to artificially contain prices within a normal range in the New York area. They also doubled the number of drivers paid to be available for hire. As rides go, however, top marks go to New York's Metro Transit Authority. Ever since the MTA could first roll back into action, offering limited bus service in the New York City area, and now that some rail and subway lines are coming back to life, not a dime has been collected in fare tolls. The MTA is spending about $18 million per day to keep New Yorker moving wherever conditions allow. Free self-storage would thrill any real estate-deprived New York area resident even in the best of times. During the Hurricane Sandy recovery, dry, clean space is even more valuable, especially to those facing property damage or those forced to bunk with friends, family, or strangers. Right now, U-Haul (UHAL) is offering 30 days of free self-storage and U-Box pod moving to assist victims of the storm. Duracell (PG) gained some energized fans by taking to the streets of the New York metro area this week with its Duracell Rapid Responder truck. Employees handed out free batteries and access to charging lockers. During the height of the storm on Monday night, one of the most retweeted photos of lower Manhattan was of a Reuters shot featuring a glowing Goldman Sachs (GS) building, the only tower in the financial district still illuminated. To one Twitter pundit, it represented "everything that is wrong with this country." Goldman later clarified the situation, explaining that the bank did have its own generator, but that it wasn't the only building with the lights on in the area. Indeed, a second photo emerged proving that statement to be true. But the damage had been done on a symbolic level, as exemplified by a tweet from BBC program Have I Got News For You: "Reportedly the only building with electricity in downtown Manhattan is Goldman Sachs, which gets its power from an underground source: Hades." Even New Jersey Governor Chris Christie, a diehard Republican, had admiration for President Obama's handling of Hurricane Sandy. "It took hurricane-force winds to blow a Republican and a Democrat together," said David Letterman on his show. So what does it take to make Donald Trump start acting like a decent human being? Not even the tragedies reported from across the New York metropolitan region and hard-hit New Jersey could take Donald Trump's mind off his personal vendetta against the US president. Throughout the ordeal, Trump took cheap shots at Obama, in one case saying: "Hurricane is good luck for Obama again – he will buy the election by handing out billions of dollars" and "Not only giving out money, but Obama will be seen today standing in water and rain like he is a real president -don't fall for it." Another tweet read, "Today Barack Obama is standing in water in NJ. Remember on election day that he has put the US underwater." Nice going, Mr. Trump. That's the American way. We mentioned that banks are waiving fees for victims of Hurricane Sandy, but there was one bank not on the list: Bank of America (BAC). Initially the bank said customers would need to call the company's 800 number or visit a bank branch to prove their need and have fees waived. That was an unpopular position that quickly brought bad press and angry postings to the bank's social media pages. In an updated statement, the bank has since said it would automatically waive fees incurred between Monday, October 29 and Monday, November 5. Much better. There have been conflicting reports about the way hotels have approached the sudden demand for extra rooms to house stranded travelers and area residents seeking warm, safe shelter. Some chains, like Kimpton, the Aqua Hotels and Resorts, and others, were praised for offering rooms at a discount and waiving cancelation fees. Several New York hotels, including the Ace and the Four Seasons, were also applauded for allowing free Wi-Fi usage, running movies for kids, and offering cooking classes for bored-beyond-belief adults. But tales of price-gouging have also been circulating, with customers complaining that they've seen their per-night rate doubled from one night to the next due to "occupancy levels," as a hotel GM might say. CNBC has reported that many New York hotels dropped the discount programs accessible via online booking sites. Most shameful among the storm's villainous characters are those gas station and retail shop owners who stand accused of jacking up prices for in-demand necessities, including gas. Reports on Twitter have gas selling for $5.99 per gallon at some stations and at least one New Jersey news outlet has proof of $5.49 price tag. Storm victims in New Jersey and Connecticut have also seen the price of generators double in days (reports are unconfirmed) -- even coffee that formerly sold for $1 per cup, is now $3 at some bodegas. Anyone who suspects price-gouging is asked to report it to state authorities by calling 800-242-5846 in New Jersey, 800-697-1220 in New York or 311 in New York City. It's the downside to social media's immediacy: Craven marketers have less time to give a sober second thought to their knee-jerk reactions to big public events. Among the myriad reports of grossly inappropriate Sandy-related advertising campaigns, the three worst offenders mentioned most often were American Apparel (APP), The Gap (GPS), and Urban Outfitters (URBN). American Apparel, no stranger to controversy already, emailed a marketing campaign saying, "In case you're bored during Hurricane Sandy. 20% off everything for the next 36 hours." The Gap tweeted, "All impacted by #Sandy, stay safe! We'll be doing lots of online shopping today. How about you?" And later apologized. Urban Outfitters emailed its client list with ad that read, "This Storm Blows, But Free Shipping on All Orders Doesn't." One was to enter the code "ALL SOGGY" during checkout to get the shipping deal. Animated cats and dogs tumbled down the ad, as if falling from the sky. Feeling sick yet? When airlines cancel due to their own fault, such as a mechanical mishap or pilot scheduling screw up, they are liable for expenses their delayed passengers incur. They don't want you to spend a week in a $200 a night airport hotel room buying clothes and toiletries and eating breakfast, lunch, and dinner on them. But when the cancelation is "weather related," they are not obligated for such expenses. It costs them nothing for you to sit at the airport for a day or a week, even though it might cost you and your family hundreds or thousands of dollars. No matter how long you wait, when they do get around to flying you to your destination, they still get the money you paid for your flight.